This Spanish dish is absolutely amazing. 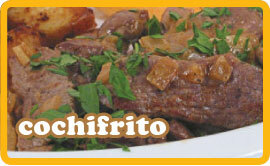 It’s a simply prepared dish which brings out all that is wonderful about lamb. It’s one of those dishes you can’t quite believe you made. It’s one of the tastiest things I’ve ever eaten. Ever. In. My. Life. Mashed potatoes and some vegetables.